This past weekend baseball writer Peter Gammons was seen enjoying the Sox-Yankees game (masacree is more like it) . It was his first time back to a park after his recent brain surgery. This is a great story by itself but there was one other part that caught my eye. Gammons visited the writers and both clubhouses. He spoke with Yankee GM Cashman and Mr Torre. But turns out the guy Gammons most wanted to see and talk to was Yankee hitting coach Don Mattingly. While Mr Gammons was in the hospital, Mattingly sent him a silver cross with a get well note. The cross was a gift Mattingly received from his wife and he had worn for several years. Gammons said "They day I got it and put it on in the hospital was the day I turned around. 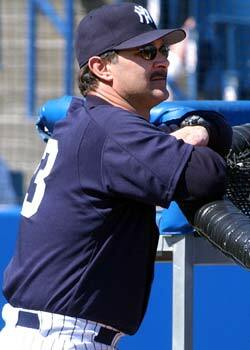 He (Mattingly) and Kim(wife) are pretty unbeliveable". Mattingly said when asked about this gift "I dont know what made me do it. I just was moved to do it".